Soothing...and stimulating are the words that define our Rose Incense Sticks perfectly. Its enchanting fragrance that lingers for long hours has created its demand in national and international markets. We have formulated it with the selected rose flowers, essential oils, aromatic ingredients, and many other biotic combustible materials precisely composed. Each of these rose fragrance stick carries the legacy of enchanting fragrance of rose flower. Its magical scent will surely help you to focus on the ritual for long hours thereby intensifying your concentration. The lingering effect of the fragrance of these rose based incense sticks commendable as it continues for hours. Our Rose Incense Sticks are available in long sizes that adds more value to this effect. However, we are very much concerned about the affects of inhaling the smoke for long hours thus we have conduct various clinical test regarding the same. Results of this test has been very positive for our product ensuring no harm. Apart from product, we also focus on packaging. 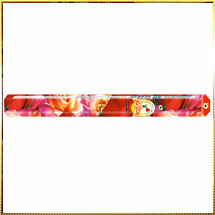 Our Rose Incense Sticks are available in attractive packs which grab all attention.